Yesterday (day 5) was spent working and then going out for a birthday dinner for our wonderful friend, Morgan. She’s 17! I was able to fill the cop on my trindle and slid that off so there is evidence of spinning. See? We arrived home to a poor Spawn #2 who’s down with strep throat. We sat with him while he slept and dreamt of scary, feverish things and today I am working from home to make sure he’s medicating and eating comforting things. 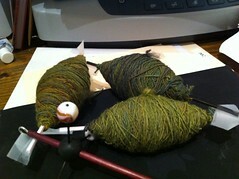 I do plan on getting some more spinning done today and will have evidence tomorrow.